PLOT SUMMARY: Morrigan Crow is cursed. Not only is she blamed for everything that goes wrong in her hometown, but she is doomed to die on her eleventh birthday. However, the night she turns eleven, Morrigan is rescued by an eccentric man named Jupiter North, who has an infuriating ability to not answer many questions. Jupiter whisks Morrigan away to Nevermoor, a secret, magical world, where Morrigan will be safe from what hunts her. However, in order to stay, Morrigan must compete in the Trials and join the Wundrous Society. Only nine out of hundreds of applicants will be chosen, so Morrigan will have to fight tooth and nail to be able to stay in the safety of Nevermoor. FIRST THOUGHTS: I've heard a lot of hype for this book, and I was actually hoping to get to it in 2017. Yeah... I hope for a lot of things that never happen. But I'm so glad that this was my second book of 2018, because it truly was a delight. This is a fun, magical adventure with a fantastic main character, and I enjoyed every page. This is a book aimed at middle schoolers, but the idea that adults can't (or shouldn't) enjoy children's literature is nonsense. If a children's book is truly well-written, it'll have something to offer to older audiences, too. This book is a prime example of that. THOUGHTS ON PLOT: I've heard this book's plot be compared to Harry Potter, and while there are some parallels, I don't think that's entirely fair. Stories about outsiders discovering a world of magic were around long before J.K. Rowling ever picked up a pen, and they'll be around hundreds of years from now. Humanity loves a fish out of water, it appears. That said, this book uses that plot extremely well, and the element of competition with the Trials makes it all the more exciting. 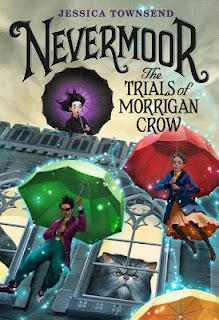 Since Morrigan has literal death hanging over her head if she's forced to leave Nevermoor, the stakes are extremely high. The story takes place over the course of a little under a year, but it moves at a brisk pace, never dragging for too long, which is nice. I especially loved the Trials themselves; they were extremely well thought-out, and got me thinking about how I would handle it if I was competing for the same position Morrigan was. The ending is a definite sequel hook, as this is the first in a series, but I honestly have no idea where Townsend tends to take it -- and I can't wait to find out. THOUGHTS ON CHARACTERS: There are no words to describe how much I adore Morrigan as a main character. She's an outcast and an oddball, but extremely easy to relate to and root for. Her snarky-yet-earnest attitude greatly reminded me of Matilda Wormwood, but Morrigan is definitely her own character. I especially loved her interactions with her mentor, Jupiter. I suspect Jupiter's got some hidden depths we'll see in later installments, but what we got in this book was great. His parental role towards Morrigan was a genuine breath of fresh air, after the opening chapters establish how absolutely crap Morrigan's biological father is. (Seriously, Jessica Townsend, if you're reading this; please have someone slap him in the next book. I'll love you forever.) Morrigan and Jupiter's dynamic felt incredibly real, and their banter is some of the best writing in the book. I also loved Hawthorne, Morrigan's fellow competitor and best friend. I liked how, despite being rivals in the Trials, Hawthorne and Morrigan are thick as thieves, and don't let the Trials get in the way of their friendship. The villain is also fantastic -- I can't say too much about them here, since they're a major spoiler, but I am so looking forward to seeing more of them. My main complaint is that aside from Hawthorne, the other competitors all felt really one-dimensional. Some of them had potential, like Cadence and Noelle, but they went mostly underdeveloped. Here's hoping they turn up in the next book, with more to offer. THOUGHTS ON WRITING STYLE: Reading this book transported me back to when I was nine and first reading the Harry Potter series. Judging from other people's reviews, I'm not alone in this. This is a middle grade book, meaning it was written for people seven to ten years younger than me, but it's still deeply enjoyable for teenagers and adults. It doesn't dumb anything down, or condescend to its audience, which I think is vital for children's literature. It has a lot of whimsical turns of phrase and clever hidden meanings, some of which you won't catch the first time they pop up. Basically, if you like the writing of Roald Dahl -- which I do -- you'll probably like this. THOUGHTS ON POLITICAL STUFF: Pretty good, but not in the way you'd expect. There are a couple POC, and a side character who's disabled, but none of that is brought up much. There is, however, a very strong pro-immigration message, which really surprised me, because that's not something you'd expect to see in a middle grade fantasy novel. A large part of the conflict stems from Morrigan being an "illegal" in Nevermoor, and how certain people want to deport her back to her hometown -- despite the fact that Morrigan is a child who desperately needed to escape her situation, and that Nevermoor is the only place she can be safe. Jupiter also has a great line about how being a "great" country that then turns away people that need your help is hardly something to be proud of. In this post-Trump world, we need to get this message across early. My only real complaint about this book is how Morrigan doesn't have any truly positive female relationships. (Unless you count Fen. True, she has a definite personality, but she's also a cat.) Almost every other female character is a rival or obstacle for Morrigan, or a distant (if generally nice) authority figure. I'm glad to see a male-female friendship, but I'd love to see Morrigan link up with some other girls in future installments. FINAL THOUGHTS: This is a fantastic opener to a new series, and I cannot wait for the second installment. The Trials of Morrigan Crow is funny, exciting, and is actually one of the few books that actually made me tear up a little while reading. Whether you're in sixth grade or your senior year of college, or are even older than that, I'd highly recommend this book. It's off to an extremely strong start, and I can't wait to see where Morrigan and Jupiter will take me next. If you've read Nevermoor: The Trials of Morrigan Crow, I'd love to hear your thoughts in the comments below! The next book I'll be reading is The Cruel Prince, but after that, I'm putting it up to a vote. Remember, only patrons get to have their say! Vote HERE.